Above: The Chapel and Caretaker's Residence. This important historic building is endangered and on the cusp of recovery. This building is an important contributing structure in a national historic district. Built in 1928, the house was constructed using Hammond Fire Bricks of clay dug from the banks of the Tygart River at the site of present-day Valley Falls State Park. Construction was the result of community interest, effort and donations. The old Hammond Fire Brick Company of Marion County donated the bricks [clay mining was an important industry here for over 140 years and WV clay was especially prized due to the small size of its particles]while plumbers and electricians donated their work at cost. Local realtors sold lots to help finance constructions. The facility functioned unil about 1980 as a mortuary chapel and as a caretakers residence and office. In the fall of 2016 renovation began in phases. A new roof was added and window replacement began. Today windows have been replaced, the interior has been cleaned up and a few rooms are nearing completion. When finished this building will be a wonderful addition to Woodlawn and to our entire community. but we've come a long, long way! Check back for updated photos & info. 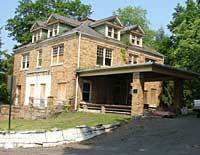 This brick four-square house at Woodlawn Cemetery is made of Hammond Firebrick with clay from the Tygart River. The building was designed to serve as a funeral parlor and chapel and to serve as offices and a residence for the superinendent. 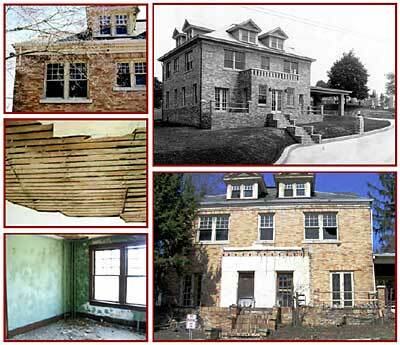 Contributions are being accepted for continuing work to restore this building. It is envisioned that upon completion it will house an area for a chapel as well as other uses for the community and the Woodlawn Cemetery. The Chapel as it was, front entry overgown with ivy. Taken from porch across street. Standing in the side driveway and looking up to the roof. 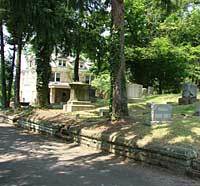 ©2012 Woodlawn Cemetery Company, Inc.